Elements of musical and linguistic education receive a particular, ongoing emphasis and are a firm component of the children’s daily schedule. Alongside our day-to-day teaching, we also regularly work on projects with activities and outings that reflect the following elements of our curriculum: musical-aesthetic education; sharing languages and cultures; physical education; drama, art and design; foundations of maths and sciences; social life. 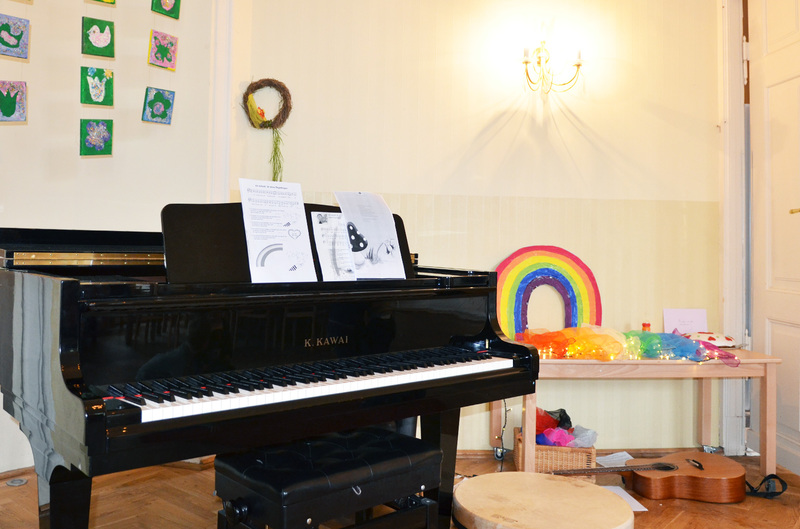 We place particular importance on early musical training at our kindergarten. Our music teachers offer our children musical knowledge appropriate to their age. Musical talent is aroused and developed through intensive development of the senses (hearing, sight, touch), through singing, rhythm, and dance, and by learning a musical instrument. We also want to convey to the children the joy of experiencing classical music. We convey to the children early on the importance of language and intercultural exchange. They learn to communicate with people of different backgrounds. By confronting the children with English every day, they go through everyday life in the foreign language and learn it on the principle of native language learning. The language is thus not actively addressed but rather learned “incidentally” in a playful way. We promote physical education both inside our premises and in our gardens. We have special rooms for physical education and health: a dance and gymnastics room on the upper floor as well as a sauna in the basement. The Villa Ritz kindergarten integrates exercise games and courses into the daily schedule. In addition to sport and dance, we also offer the children a chance to learn swimming or horse-riding. On our outside premises the children will find a generously proportioned playground with sandbox, climbing wall, wooden hut, and much open space. Our art studio on the upper floor is an ideal environment for children to explore diverse materials and many different design techniques. They can also further unleash their creative powers on our art course. Small-scale stage plays encourage them to show others their feelings using facial expressions and gestures. Every group, every child is both a performer and an audience member. Basic maths knowledge covers both the fundamentals of working with numbers and early acquaintance with quantities, shapes, and sizes. In small-scale experiments, the children are introduced to natural phenomena and scientific ideas in a way.that is both playful and appropriate to their age. Developing and deepening an individual personality and getting along with others in social situations are the focus of this aspect of our curriculum. Children of different ages come together in groups to practice interacting with one another. There is a special assembly once a week, where all the children and teachers at the kindergarten sing together and experience the community as one.